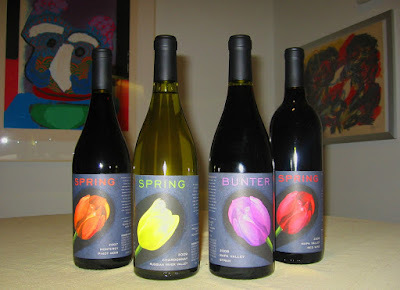 If you like very, very good ($15-25/bottle) wine, my son-in-law Mark Bunter and my daughter Margaret Spring operate a very small, very good winery in Napa. Mark is not one of those retired, tweedy stock brokers who call themselves winemakers but the real thing. He grew up among winemakers in Napa and is dedicated to making the best wine possible. Mark's general practice is to deal with valued, continuing customers by mail. He sells cases only, and generally has several varieties available, depending upon the time of the year. If you're new to Bunter Spring Winery, contact Mark. After he speaks to you about what is currently available, he'll ship a case(s) of the wine(s) that you want. When you get the wine, you send him a check. Or, if for some reason the wine is not to your taste, he'll replace the wine or return your money. It couldn't be easier, could it? "The red wine is as good as it gets and worth every penny. Full body, aroma and balance are its high characteristics. A perfect dinner wine." "The 2008 SPRING Rutherford Merlot Rose is a unique and delightful wine. My preference is to serve it chilled."